Come by Volvo Cars Cincinnati North if you are looking for a popular compact sedan that is a luxury vehicle and one outfitted with great technology. We would be happy to show you the Volvo S60 and help you see what it offers to you. 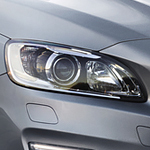 There is an available camera for the Volvo S60 that allows you to see all around your vehicle. You can set this sedan up with that feature if you are someone who gets nervous about backing up and parking your vehicle. If you are interested in looking to music while you are traveling, you will be impressed with the sound system that comes standard in the Volvo S60. You will get set up with thirteen speakers in this car, and you will enjoy listening to all of your favorite songs through those quality speakers. The Harmon Kardon sound system in this vehicle is a high class one that is made to impress.